Quite a few years ago, when I was young, slim, and could easily lift boxes, I worked for the Classics Bookshop chain, in their Don Mills Centre location in Toronto. Don Mills was one of the very first “planned” suburban communities in Canada, developed in the sixties and perched above the Don River valley, in what was then considered the northern most reaches of the city. Don Mills Centre was the retail heart of the community – an open–air bustling plaza with grocery, department store, post office, and any number of shops and restaurants. It was a busy, happening place. Over the years, it evolved with the community – it was enclosed in the late seventies, retailers opened, closed, and moved on (Classics included). By the early 2000’s the community had changed considerably – the suburb was no longer on the edge of the city, the original home buyers were now seniors, condos and apartment buildings were more prevalent, old houses were replaced by new: the demographics of the community had come full circle. The Centre had become somewhat tired, bypassed by major retailers in favour of larger, more dynamic shopping centres, and frequented mainly by seniors who liked its size and accessibility. In 2006 the old Centre was torn down, and a new retail village began to take shape. 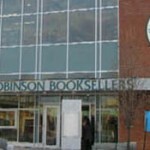 On April 22, 2009 the plaza, renamed the Shops at Don Mills opened, and amongst the familiar Eastern Canada retail names is a new one from the west: McNally Robinson Booksellers. McNally Robinson is a well known, much beloved, independent bookstore chain based in Winnipeg, owned by Paul and Holly McNally, with stores in Manitoba and Saskatchewan. This is their first foray into the central region of the country (although American readers may know of their sister store, McNally Jackson in NYC), and despite the difficult economic times, I fully expect they will thrive and be a welcome addition to the great Toronto bookselling community. 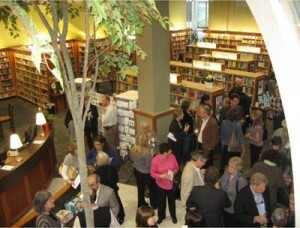 On April 26th, the McNally’s hosted a champagne celebration for Toronto-based publishers and their fellow booksellers. The new store is bright and airy, with many of the same distinguishing characteristics of its siblings: a dedicated space for daily author events, dynamic and thought provoking book displays, enlightened and informative bookseller recommendations, and the trademark tree – towering above the bookshelves (handmade by Paul himself). A couple of weeks later, on Mother’s Day, I went back with my Mom (a dedicated Ladies who Lunch sort of gal) for brunch at Prairie Ink – the in-store restaurant. The restaurant was packed with families, and the bookstore was hopping: children happily reading in the kid’s section, adults of all ages engrossed with the wide variety of books and magazines. The Shops at Don Mills has breathed new life into a community, and it seems to me the new McNally Robinson will be the heart of that neighbourhood, as all bookstores should be. Welcome back Don Mills, and welcome to the east McNally Robinson!